There are two kinds of clients. Listen and learn… and be prepared to get out of your own way. Not all marketing is marketing. People do business with people like. Seek first to help, then to sell. This month, we’ll add 10 more to the list. 11. Don’t rely on other for your success. Now, referrals and W-O-M are both good things… the trouble is, they rely on someone else to make you successful. Is that really what you want? In addition, this kind of help from outsiders inevitably lessens or even dries up (your supporters retire, resign or otherwise move on). To ensure your success, you must take a proactive approach to your marketing and sales. It starts with a well-thought-out plan, smart go-to-market strategies, a consistent level of activity, measurement and continual improvement (based on the measurement findings). 12. What do you stand for? In our ultra-competitive, commoditized marketplace, why would a potential client pick you? And, “We do great work… have great people… and provide great client service” doesn’t cut it anymore. Everybody says that… whether it’s true or not! To stand out, you must find something that helps to separate you from all (or most) of your competitors – something that you want your firm to be known for and that your clients and prospective clients will care about. Maybe it’s one of these: an industry focus, a methodology focus, an application focus, a market focus, a technology advantage or a unique business model. Regardless of which direction you go… commit to it, integrate it into your operations, then market the hell out of it. 13. It all starts with awareness. Bottom line: potential clients can’t do business with you if they don’t know you exist! 14. Social is here to stay. Like it or not… believe it or not… agree with it or not… social media is here to stay. More importantly, it IS where your clients and prospects spend time… so you have to be there. Learn to get comfortable posting, sharing and engaging. Do a little every day. Social media marketing is a proven way to build awareness (see #13), share your expertise and help to position your firm (see #12). All of which can lead to a buyer-seller relationship. 15. Successful business development is a commitment. My response? “Then it’s not a priority for you.” By contrast, regardless of how busy you are, you still manage to pay the rent on the first of each month, right? And you still find the time to invoice your clients after each project? Of course you do. Business development is no different… and is just as critical to the success of your business as having an office and getting paid. Want to be successful at marketing & sales? Then commit to it! 16. Hire sales people with sales experience. When hiring for ‘research sales,’ too many business owners worry about the ‘research’ part… and not enough about the ‘sales’ part. Which is, after all, the goal of the position. Rule of thumb: it’s a lot easier to teach research to a good sales person… then to teach selling to a good researcher. People don’t buy drills at Home Depot because they need drills… they buy drills because the need holes! 18. Do a little bit every day. One of the biggest challenges every firm in our industry faces is the feast-or-famine nature of the business. This general happens because we squeeze our business development efforts in-between projects… which gets us into the on-going cycle of project – biz dev – project – biz dev – project… you get the picture. One way to mitigate that is to make sure your marketing & sales efforts are spread out over time. That is, do a little bit every day and every week… regardless of how busy you are. Try this… block off 30 minutes every day (over your morning coffee) to do some small things… write a blog post, make 2-3 sales calls, connect with other on LinkedIn and so on. And pretty soon, all of those little things will add up to something big! 19. Don’t just hire salespeople… you have to manage them, too. Managing sales people is uncharted territory for many (if not most) business owners. They hire a sales rep, spending a week cramming their head full of information (calling it ‘training’), give them a list of potential clients and then send them out to sell. Then, when the rep fails to deliver a new client in the first couple of weeks, the owner seems surprised. Really?! Most good salespeople are solo operators… but that doesn’t mean they don’t need help, guidance, refresher training, patience and empathy from the owner, help from marketing, technology tools, reasonable goals, an understandable compensation plan, sales meetings and so on and so on. Without these support mechanisms in place, the chance of your sales rep(s) achieving a level of sales – that delights both them and you – is drastically reduced. 20. Talk to your clients. We work in the Market Research industry where we help the end clients get feedback from their target market. Yet, we rarely do the same thing. But it’s critical… by getting regular feedback from our clients, they will tell us what products and services we need to produce for them, what content they want us to write for them, what issues they have that we can solve for them… and not insignificantly, how to sell to them. And when all else fails… picking up the phone and talking with them. Marketing and sales are fundamental building blocks for a successful (and sustainable) business… no less important than operations, finance and HR. 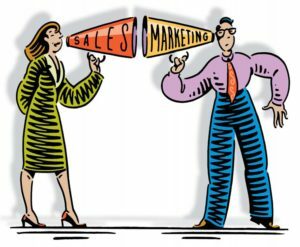 So, as you look to start (or enhance) the business developments efforts at you firm, follow these 20 marketing and sales concepts to solidify that foundation. What did we miss? Do you have any other key marketing and sales concepts that should be added? If so, we’d love to hear them… please share them below.